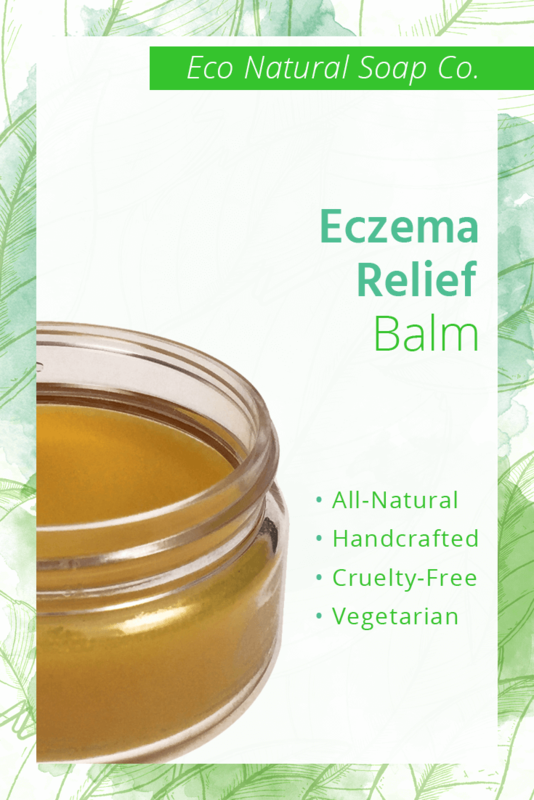 Eczema Relief Balm – Eco Natural Soap Co. The oils, herbs, and botanicals in our Eczema Relief Balm have been carefully selected for their gentleness and effectiveness for people struggling with eczema, while eliminating all of the synthetic ingredients and harsh chemicals that often aggravate skin concerns, and can cause eczema flare ups and further skin irritation. This balm can be used for any type of eczema, and is safe to use all over your body. It has been formulated to work optimally when paired with our Eczema Relief Soap, as a two-step combo for relief from eczema. Linum Usitatissimum (Linseed/Flaxseed) oil, Calophyllum Inophyllum (Tamanu) oil, Prunus Armeniaca (Apricot Kernel) oil, Persea Americana (Avocado) oil, Prunus Dulcis (Sweet Almond) oil, Azadirachta Indica (Neem) oil, Olea Europaea (Virgin Olive Oil), Vitellaria Paradoxa (Shea) butter, Garcinia Indica (Kokum) butter, Simmondsia Chinensis (Jojoba) wax, Rhizoma Atractylodes/Rhizoma Atractylodes (Cāng Zhú) root, Cortex Phellodendri (Huáng Bǎi/Huáng Bò/Yellow Fir) bark, Cortex Moutan (Mu Dan Pi/Tree Peony) root, Lonicera Japonica (Honeysuckle), Bupleurum, Hippophae Rhamnoides (Sea Buckthorn), Mentha Piperita (Peppermint), Centella Asiatica (Gotu Kola), Schisandra Chinensis (Schisandra), Larrea Tridentata (Chaparral), Juglans Nigra (Black Walnut), Galium Aparine (Cleavers), Chelidonium Majus (Celandine), Coptis Chinensis/Rhizoma Coptidis (Huang Lian/Chinese Goldthread), Mentha Spicata (Spearmint), Camellia Sinensis (Green Tea), Stellaria Media (Chickweed), Olea Europaea (Olive Leaf), Rumex Crispus (Yellow Dock Root), Trifolium Pratense (Red Clover), Urtica Dioica (Nettle), Silybum Marianum (Milk Thistle), Tabebuia Impetiginosa (Pau d'Arco), Arctium Lappa (Burdock Root), Glycyrrhiza Glabra (Licorice), Matricaria Chamomilla (Chamomile), Cera Alba (Beeswax), Calcium Bentonite (Pascalite) clay, Citrus Limon (Lemon) essential oil. For best results use morning and night on the affected area(s), after cleansing with our Eczema Relief Soap. Copyright © 2019 Eco Natural Soap Co.